Comedy home secretary Charles Clarke does have his uses, though. Last week, he stated that he would use the UK presidency of the European Union (when he will chair the council of interior ministers) to improve cross-European preparedness for natural disasters and major terrorism. He mentioned specifically that the financial system was vulnerable to cascading effects from an attack in one state to others. Does anyone think he’s been reading John Robb? Dark globalisation, cascading network failures, systempunkts – it’s all right there. Who would have cast the Safety Elephant as Europe’s general for 4th Generation Warfare? ID Cards – As Bad as you Thought, But Worse! The Government’s crusade to breathe life into its dead ID Cards scheme ran deeper into trouble this week. First, along with the old-new Bill, the results of the Home Office’s trial of biometric identifiers were out. The HO tested its gizmos on 10,000 guinea pigs/citizens, and came back with a best result of a failure rate of 4%. Now, 4% does not seem very much. It seems even less if you call it a success rate of 96%. But, as Karl Marx said, quantity has a quality all of its own. 4% of 10,000 means that 400 people were misread, misidentified, or not identified at all. As the ID card and its monster database threaten us with a fine of up to £2,000 for anyone whose card is “damaged”, even if they don’t knows it (that is to say, anyone whose card does not swipe properly), and much worse for anyone who has a false card or someone else’s card (that is to say, anyone whose card the machine misreads), this would have been 400 possible miscarriages of justice just from the trial alone. If “miscarriage of justice” is too much, then it was at least 400 cases of inconvenience, embarrassment and administrative cost. That was for the sci-fi super soaraway iris scan. All the other options were worse by an order of magnitude at least. Now, there are 60 million or thereabouts people in Britain. 44 million are slated for tagging. Even as a one-off, that makes 1,760,000 cockups from the iris scan alone, not to mention the hopeless facial scan, which failed on 30% of cases. Better yet, the system didn’t just not work, it discriminated. Older persons and – guess who? – black people were far more likely to be misidentified. That is to say, one of the biggest target-groups for police ID checks is also the most likely to be victimised by the machinery. Advice: if the ID Cards Bill comes in, and you’re black, get a good lawyer now. Today’s Observer pours on the vitriol. According to a study carried out by the London School of Economics, it seems, the cost of ID cards and a monster database of absolutely everybody will be north of £12 billion and nearer £18 billion, or £300 a card. Not only that, they argue that the cards will need renewing twice as often as the government says. And changes of address will require something between 300 million and 1.2 billion changes to the Big Database over 10 years. We are looking at an IT equivalent to the Tower of Babel here. To get that error rate down to non-terrible levels, the whole thing will have to be reliability-engineered to the standards of the public-switched telephone network. Which costs money. Lots of money, especially when it’s not just a database but also a biometrics system. 99.999% reliability on 99.999% uptime would still leave us with 44 wrongful arrests, though. Eighteen billion quid. For what? To save us whatever fraction of the highly dubious “£1.3 billion” actually is attributable to frauds the cards might stop? Given that a majority (let’s say, for argument’s sake, half) of that figure is credit-card not present scammery, that’s £650 million a year. On the lowest costing, we would be paying £1.2 billion a year to save £650 million. This is madness. An Antonov-12 aircraft was destroyed in the DRC on Thursday, with a reported loss of 27 lives. As far as I know, the registration was 9Q-CVG, which if true belongs to a Boeing 707 last heard of being scrapped in Kinshasa, ex-Hewa Bora Airways. The An12 was said to be operating for something called Air Victoria (hmmm…). The dead included four Russian, or Ukrainian depending on report, aircrew and 22 nameless passengers. It’s rough when they don’t even give you a nationality. I don’t at the moment have any data about owners or even a truthful registration, so I won’t mention you-know-who. It’s reported that both engines failed, tho’ the status of this information is dubious. Just back from a trip outside the EU, to Norway as a matter of fact, to ask questions of a bunch of Chinese telecoms people who just put in the first US-type (CDMA-450, fact fans) network in Europe there. Sitting in Oslo airport, waiting for a colleague to rock up from Stockholm, the sweating hack-gaggle (all right, three of us) was left to chat to a Chinese representative of A Certain Telecoms Kit Manufacturer. As always happens, the conversation moved to European geo-politics. It always happens like that. Really. It wasn’t even my fault this time. She had a couple of very interesting points to make. The first was that, apparently, Europe had “a debate that China has never had – where it begins and ends. We’ve always known clear borders.” Indeed. The cliche form of this, in European discourse, is the contradiction between the old cold-war Western Europe and de Gaulle’s crack about a Europe from the Atlantic to the Urals (which was real at the time, but only for the military planners). More importantly now, her company has set its bridgehead for Europe in Istanbul. Asked whether they assumed Turkey would join the EU, they said yes. But here we were, in non-EU Norway. (Note – I’m not going to pretend that Oslo is wracked by nationalist gangs sniping at each other from barricades of blazing cars and bread riots and all that comes from outside the union.) But looking at it another way, it made more sense. Norway has to accept the EU’s single market regulations to deal with the EU under the EEA Treaty, but it has no vote in Brussels. It’s a committed member of NATO. Next door are Sweden, in the EU but not the Euro and certainly not NATO, and Finland, in both EU and € but very neutral, and down the road is Denmark, in the EU and NATO but not the €. Question: do the Chinese believe that all these overlaps will be sorted out in a rationalised EUrope, or do they believe that they will matter less? You may insert your own comments with regard to Iraq in the comments, naturally. Not only do these pages reflect an impressive commitment to the avoidance of offence, some also show a degree of self-knowledge regarding the troops, and a healthy disrespect for (someone else’s) imperialism. “Britain’s first hi-tech identity cards are being issued to London workers today, the Evening Standard can reveal. The cards, containing details of credit history, criminal records and immigration status, are being introduced to combat identity theft and illegal working. Foreigners? Well, that’s all right then. Regular readers may recall this post from July, 2004 on the danger of RFID, and especially this one from May, 2004 on the possibility of segregation by ID. As everyone probably knows by now, German Chancellor Gerhard Schröder is trying to call new elections after a cudgelling from the electors of Nordrhein-Westfalen. I say trying, because unlike in Britain he doesn’t have direct control over the dissolution of parliament, and he may have to arrange his own defeat in a vote of no-confidence. Which would be fun. There’s plenty of stuff wandering about the interwebs on this event, but I’d like to focus on a couple of things. For a start, I was amused in a dark sense by a remark of the Schockwellenreiter‘s in which he said (roughly) “I know I’ve said enough about the SPD’s swing to the right, but that’s no reason to go out and vote conservative!” Well, this is a case of the inherent danger of voting for a party you don’t want to elect – unlike in the British general election just past, your protest vote really could put in the conservatives. French readers, take note – if you are thinking of a “non de gauche” or a “non pour l’Europe”, don’t delude yourself. They’ll put your vote in with the Front National bloke from your local cafe who sweats red wine and spits at anyone who looks North African. Seriously. Moving swiftly on, Schröder’s coup de théatre has revived one of recent German politics’ favourite rows, the K-Frage. That is, who should be the candidate of the Right for the chancellorship. You’d think it was easy, that the one they elected as party leader might get the job, but that would be too simple. Although Angela Merkel was, ahem, elected, after a bout of hard-core internecine backstabbing she was kiboshed in favour of Edmund Stoiber. Stoiber, the elected king of Bavaria and protégé of Franz-Josef Strauss, turned out to be just too rightwing, too Bavarian, too Catholic, and too old-fashioned for the public, and Schröder got a pass. Now, anyone with any sense could have told them Stoiber was a very rightwing, very Bavarian, very Catholic, old-fashioned machine politician, but unfortunately the CDU-CSU delegates tend themselves to be old-fashioned, rightwing, Catholic, Bavarian machine politicians. Angela Merkel, however, is a Prussian, Protestant, right-liberal sort – and, perhaps most importantly, she’s a woman, which the pompous old buffers of Swabian politics weren’t ready for. Merkel has spent the intervening period practising the art of internal party politics, progressively culling out the buffer herds from the CDU federal offices. They push back, of course, but their options have been so limited that for a while they were seriously spinning a return of the old crook Wolfgang Schäuble in the columns of the FAZ. It now seems that her hour is at hand. And I think, contrarily to Tobias over at AFOE who claims she has “negative charisma”, that she’s going to win. I have two reasons for this: first, that she makes the CDU look more like Germany. The CDU-CSU grew up in the two-thirds Germany of 1945-1990, which meant it could govern from a base in the Catholic south and south-west, simply because half the Lutheran and SPD-voting north had been lopped off by the Red Army. The regional split was exemplified by this: the CDU’s election-night party served white wine, and the SPD’s served beer. With reunification, the north is back. Bavarians seeking the chancellery will always run into a headwind for this reason. Second, that she represents the Party of Change. Schröder reminds me in some ways of John Major. At bottom, he’s an unprincipled operator who inherited more than he cares to admit from the Kohl years. He’s now, by the way, embarking on something very similar to John Major’s half-resignation in 1995 – does he hope to make Franz Müntefering his John Redwood? – with the important difference that he’s going the whole hog and asking the people to decide. A curious feature of the crash in NRW is that the Greens, Schröder’s coalition partners, were wiped out. Going Green has always been a vote for “change”, and I wouldn’t be surprised to see some of their army of feminists swinging to a “first woman chancellor” campaign. This “change” factor is doubly important, because the easy reading of the NRW election is both easy and wrong. Painful economic reforms, working class protest against SPD sell-out/unrealistic and reactionary resistance to liberalisation (delete version not suiting your prejudices). But the NRW public voted for a party that says it will cut subsidies to the Ruhr coal mines – a rebellion against Hartz-IV? Surely not. Coincidentially, on the same day, General Motors announced that the Saab 9-5 will be built, not in Sweden, but in Rüsselsheim, home of Opel. Uncompetitive? Reports of German industry’s death have been greatly exaggerated. I don’t know about you, but when I look at an economy with flat growth, low inflation and the world’s biggest export sales despite a surging currency and high oil prices, I don’t see desperate inefficiency at the heart of its problems. Neither can I take seriously the chap who’s making a mint selling a Hartz-IV cookbook for people supposedly reduced to eating grass, except perhaps as a money-making proposition. Come on, it’s hardly Bradford in 1992. What Germany needs is perhaps some fiscal or monetary stimulus, and a goodly dose of confidence. They will have the immeasurable advantage of starting economic recovery with a world-class industrial base and monster trade surplus. And, with any luck, the FDP will keep any Thatcherite fantasies on Merkel’s part from wrecking it. Richard North has answered my question, stating that neither he or Helen Szamuely has been paid for their efforts with the Bruges Group. However, EU Referendum Blog still doesn’t carry any disclosure of their association with the Group for a Europe of Democracies and Diversities (the European Parliament caucus that includes UKIP) or the Bruges Group respectively. This may seem petty, but can anyone else imagine the hyperventilating spasm of rage the Right would work up if – say – a blog calling itself Euro Referendum was to set up, claiming to – say – “discuss the UK referendum campaign”, operated by the director of research of the Britain in Europe campaign and the former head of research of the Party of European Socialists, without making any mention of their former lives? They’d be bleeding from the eyes with loathing. Total disclosure, for the commenter who saw fit to accuse me of being funded by the “Yes Campaign”: I have never received any financial or other consideration from anyone in relation to this blog. My only partisan affiliation is that I am a member of the Liberal Democrats, a fact repeatedly alluded to in posts on this blog since November 2004 (when I joined) and also in my campaign reports on General Election ’05. It would be difficult in the extreme to receive money from the “Yes Campaign” because it doesn’t exist yet. My income originates from my day job on Mobile Communications International magazine, the world’s longest running journal for the mobile industry. I recently refused a trip to San Diego funded by Qualcomm, Inc. on ethical grounds. I do not and have never claimed impartiality (see the strap line at the top of this blog). Democracy is something we do. It’s not in the structures, but in the practice of democracy, that its benefits emerge. So, I’m kicking off a series of blog posts on how to be a democratic Europe. Or, if we want a more democratic EU, how we can do democracy in Europe. As a start, Nosemonkey passes on a cool idea fielded by Labour MP Derek Wyatt. He’s passing an Early Day Motion to mandate British MEPs to return to the House of Commons every month and report back on what they’ve been up to, rather (the key point) than making the risible multi-million pound commute to Strasbourg. This is well worth supporting, because not only does it reinforce the link with their constituencies, it also provides the best way to end the Brussels/Strasbourg duplication. That is, the boycott. After all, the only reason it still happens is because key marginal constituencies in France do very nicely out of EP spending and MEPs’ personal spending. And nothing, but nothing, would do more to explode the stereotype of the EU as wasteful, byzantine and generally evil than to end this porkbarrel nonsense. Even though an EDM won’t become law, we could still campaign for voluntary action by MEPs, across Europe and across party. If necessary, pairing could be organised to cover important votes at Strasbourg sessions. Withdrawing the honest would leave the Strasbourg attenders sticking out like a sore thumb and subject them to peer pressure. 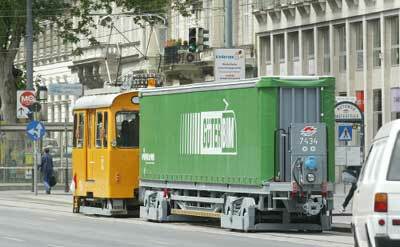 In Vienna, they’ve started running freight over the tram system. The Wiener Linien, the public transport authority, runs perhaps the best system I’ve ever met (especially as they haven’t discovered the ticket barrier yet), including an intricate network of tramways carrying a variety of different trains that I’m not sick enough to detail. The plan, now, is to carry goods needed to maintain the system on goods trams like the one shown, and then perhaps also deliveries to businesses in the city, waste for disposal, and maybe also post. Link (in German) and more pics: here. The trams are known as “bims” from the sound of the bell that invites the unwary to stand clear, as they go like a bat out of hell at the slightest provocation. For some reason, in my experience, the further east you go in Europe the faster the trams get – the Bratislava ones are quicker, and the huge ones in Budapest are a public menace rivalled only by the cars.